As a parent, one of the most enriching gifts you can give your kids is the gift of travel. Travel is a fun and exciting time for children. Visiting new places and seeing different cultures opens their eyes to experience the world in a new way. Studies have shown that travelling provides social and neurological benefits for children, and teaches them positive life lessons that can stay with them for the rest of their lives. But before you pack their bags and take them to the airport, you might need to take care of a little extra paperwork. Unless a child travels with both parents, a travel consent letter ensures your child will get to their destination and back without delays from authorities. What Is A Travel Consent Letter? 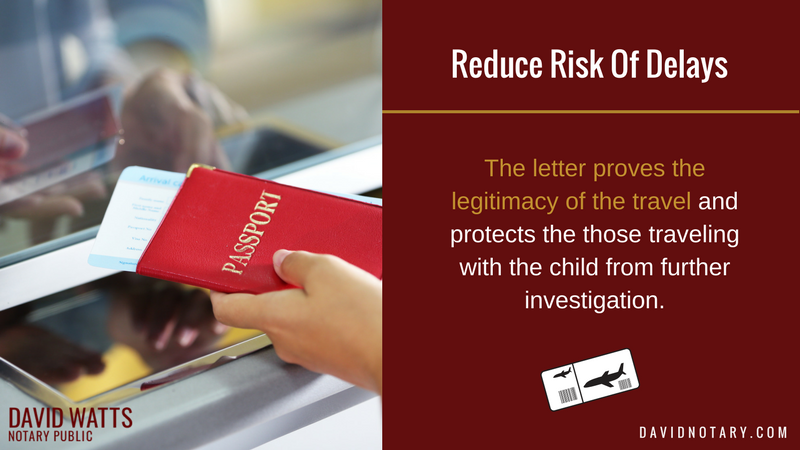 Travel consent letters are documents designed to protect children from abduction and trafficking. They demonstrate that children who travel alone, with only one parent/guardian, with friends, relatives, or groups (e.g. sports, school, musical, religious) have been given permission to travel by all of their parents (or guardians). Immigration authorities when entering or leaving a foreign country. Canadian officials when re-entering Canada. Failure to produce a letter upon request may result in delays or refusal to enter or exit a country. When Do You Need A Travel Consent Letter? Travel consent letters aren’t only for minors travelling alone or with people other than their parents. If a child is travelling with only one of their parents, they should have a travel consent letter. At any given time, Canada deals with an estimated 300 cases of parental abductions. The letter proves the legitimacy of the travel and protects the travelling parent from further investigation. They are travelling with only one parent as that parent is single, separated or divorced. They are travelling with parents who have different last names. The parents are travelling together but will travel separately with the child for a portion of the trip. The children are travelling alone or with a school, tour groups, sports team or social group. The children are travelling with grandparents, other family members or friends who are accompanying children without their parents present. What Ages Require A Travel Consent Letter? The age requirement for a travel consent letter depends on your country of destination. In most cases, anyone considered a minor may need a travel consent letter to enter or exit a country on their own, or with only one parent/guardian. In some cases, that may mean anyone under the age of 21, 19 or 18. What Destinations Require A Travel Consent Letter? While it is common for Canadian authorities to ask for a travel consent letter to begin travel, some countries may also require one to enter or leave. Some countries are stricter than others when dealing with letters of consent. It’s also smart to have your travel consent letter notarized as some countries require it. Always check with the consulate of the countries you are visiting before your child begins their journey. Names of the children with their passport number, country of issue, place and date of birth, birth certificate number and country of birth. Full names and contact information for each parent. Name, passport number and relationship to the child of the adult responsible for travelling with the child. Travel dates and details of the trip including contact information for where the child will be staying. Signatures of the parent(s) providing consent signed in the presence of a notary public. In general, travel consent letter are only valid for the trip in which they are used; however, they may be tailored if you take frequent short tips across the border and would still indicate a travel period, such as being valid for 1 year. 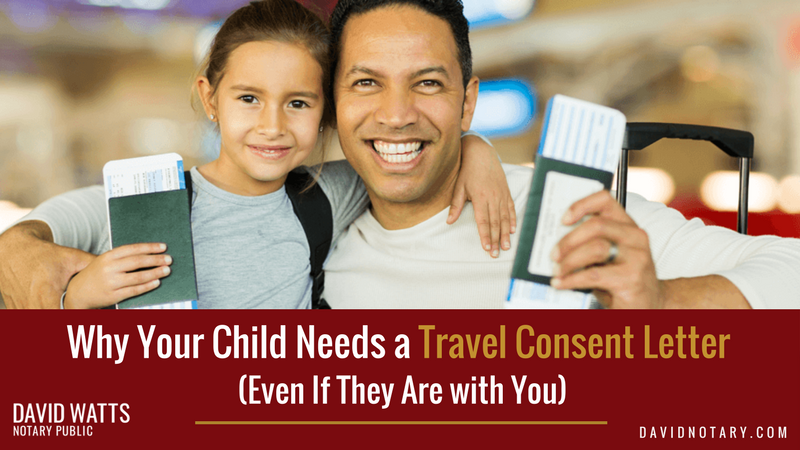 Most times a child travels without both of their parents, they will need a new travel consent letter. It’s always important to check regulations with the consulates of countries you are visiting, as there may be stricter travel requirements. The long form birth certificates showing both parent’s full names. A death certificate in the case where one parent is deceased. The court order in the case where one parent has been denied access rights. A court order stating the accompanying person is the child’s guardian or custodian. An original travel consent letter translated into the language of the country being visited. Find out the different types of travel documents you may be required to provide. For peace of mind, passports should have an expiry date over 6 months away. Take photocopies that are stored in separate luggage in case they are lost or stolen. Representation agreements allow the adult to make emergency health decisions for your child on your behalf. Most countries require the travel consent letter (and representation agreements) to be notarized. BC Notaries can help you to draft and/or sign your travel consent letter. Phone or email and we can provide a template, draft a letter and/or schedule your signing appointment. Now that the important paperwork is taken care of, your kids can have a great trip!